Julia Bonatti makes her living as a professional astrologer but sometimes the unreliable income makes her budget a bit tight. Her former boss and current astrological client, attorney David Meyers, has begged her to fill in for a week at his firm while his secretary is on vacation. Julia agrees, only to become embroiled in a murder mystery her very first day. However, the first murder won’t be the last and Julia will need to utilize every skill to solve this murder mystery. 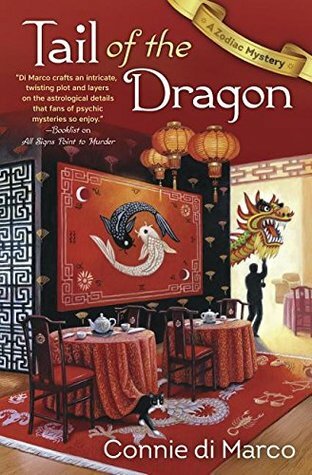 TAIL OF THE DRAGON is the third book in the Zodiac Mystery series and wow, this series only keeps getting better and better! Connie di Marco’s unique approach to the cozy mystery genre continues to intrigue me as I love how astrology plays a crucial role in the series. I also appreciate that Connie di Marco explains the more complex aspects of her astrological reasoning so that people like me who aren’t familiar with astrology are able to both comprehend and enjoy it. Julia is a great heroine! I love her loyalty to her friends, even when murder is thrown into the mix. Her bravery coupled with her quick intelligence make her the perfect amateur sleuth. I look forward to visiting with her in future books to see what troubles find her next! Connie de Marco integrates Julia’s love for astrology with her amateur sleuthing skills to craft one heck of a good mystery. TAIL OF THE DRAGON is another stunningly good tale in a series that only gets better with each installment. If you like unique cozy mysteries with lots of twists and turns, then TAIL OF THE DRAGON is just your cup of tea. Easily recommended! Right from the boat I have to say I LOVED this story! From the beginning to the end I couldn’t put it down! Violet Somerset was a terrific heroine and her attempt to save her young sister was well thought out as well as extremely entertaining! One (me) had to laugh out loud at Violet’s remarks to Nicholas, the Earl of Dare, who was so clueless as to the double entendre’s Violet was continually lobbing at him. For Nicholas, who had never had problems in seducing or attracting females – as the handsome bachelor earl – really couldn’t comprehend why he was having so much trouble trying to charm this very unique and intelligent young woman! He was told she was shy and unassuming – but with him she was anything but! I found the story be unbelievably funny, until of course the game was up when Nicolas found out his ‘Hyacinth’ was none other than her older sister Violet, who by that time was just almost ready to tell him the truth. Bottom line: Again I loved this story and can’t wait for the third book in this absolutely delightful series! Set in New York in 1924, you are introduced to 24year old Jenny Bell, who is struggling to make ends meet while studying art. Through the friendship and manipulations of her closest and – only friend – Minx Deering, Jenny is selected along with the other top students to study at the luxurious home of Louis Comfort Tiffany Laurelton Hall. Jenny has closed herself off to any romantic entanglements and for the most part trusting many people, knowing that she must rely only upon herself and is working hard towards that end. Unfortunately, Jenny’s past seems to be following her to Long Island with images of her beloved mother, her hateful step-father, waterfalls, and murder from the dark hallways of the notorious girls reformatory Andrew Mercer Reformatory for Women. As she tries to bury those memories of her imprisonment, she must keep those secrets at bay while she is being sensually pulled towards Oliver, grandson of Mr. Tiffany. Competition is fierce for the prize that is being offered for the artist who submits the best example of their art and win a spot at Tiffany’s New York Gallery. But then a series of incidents both suspicious and disturbing let Jenny know that someone is out there who knows of her past and is trying to scare her away before all is revealed. Not only did I love this story and M.J.Rose’s beautifully detailed and expressive descriptions of the grandeur of Laurelton Hall, but she drew the characterizations of her subjects with emotions and motives that one could almost believe they were there experiencing the beauty that Tiffany had created and being able to understand Jenny’s innermost issues. The romance that sprung between Jenny and Oliver was both breathtaking and a bit heartbreakingly enduring as well as very real. The suspense and nature of the villain was rather obvious but the TWIST at the end I hadn’t seen coming nor was I prepared for it. All in all – this is a book you must put on your list for a remarkable and entertaining read.